Marriage, like any other relationship, takes diligence to keep it healthy and constantly improving. All areas of our life can stand a little improvement, right? I mean – I can’t think of a single person who has reached perfection in any are of life. Your marriage is no different. Here you find 8 super simple ways you can improve your marriage today. Start the day off by connecting with each other. A simple embrace early in the morning, even if your spouse gets up earlier than you do, followed by an “I love you” is a super sweet way to connect at the start the day. Let them know you hope they have a great day. Send your spouse a romantic text message, something that you know will make their heart flutter a bit when they read it. You know them best, so I’ll refrain from giving examples. Tell your spouse how handsome he is or how beautiful she is. Look them in the eyes when you do this. Kiss your spouse instead of just a little peck. I think we can get caught up in the go-go-going of every day that we forget to pause and enjoy the moment. Make an effort to give your spouse the best of you. This means your attitude, tone, conversation. Like with #4, we can get so caught up with the mundane that we forget that our spouse has the same needs as we do. Wouldn’t you like to get the best of your spouse more often than not? Encourage your spouse. The best way to encourage them is by talking with them about their day. See how things went. No one’s day goes perfect or even close to ideal. Pay attention to what they are saying, and offer some encouragement in anything they appear to be struggling with. Spend some quality time without technology. Makes some coffee or tea, light a yummy smelling candle, and just relax with your spouse for a little bit without distractions. This is a great way to encourage each other to talk more and really connect with one another. Plan frequent date nights, even if at home. Being real – we don’t ever get a chance to go out on a date night. We have three kids and no one to baby sit. So, we have to make due with having date nights at home. They’ve become just as wonderful as out-of-the-home date nights used to be. We know one day we’ll be able to get out and have those again, but for this season of life – we are enjoying our at-home-date-nights as much as we can. I love practical, doable, and easy to remember things that I can do throughout the day that help me to continue to improve my marriage. 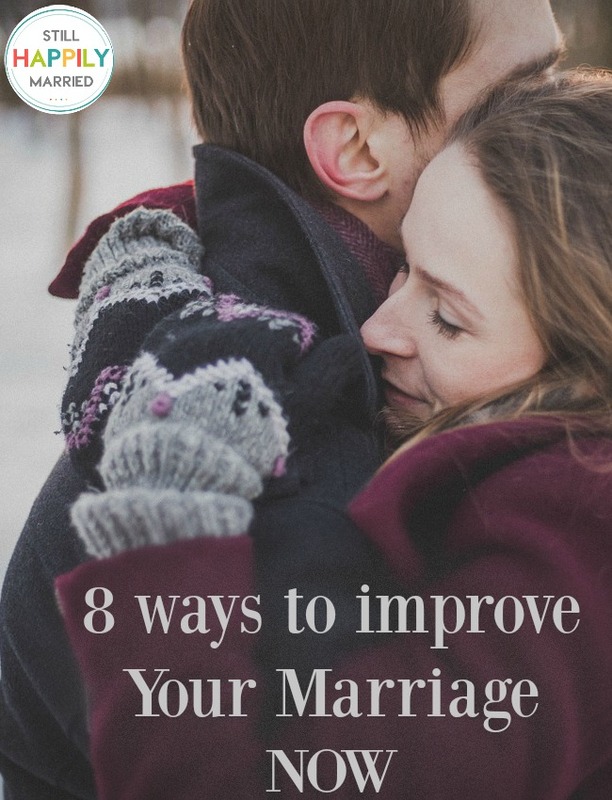 Keeping these eight simple ways to improve your marriage today in mind will help you begin to implement them in your life. You may not remember to do all of these things daily, and that’s totally fine, just pick a few and try to work on weaving them into your marriage daily. What are some small things you like to do throughout the day that help improve your relationship with your spouse? Marlene is a wife, mom, sister, and a total coffee lover. Her days as spent making my home a haven for her sweet and precious family in-between hugs and snuggles. In her down time she enjoys painting (canvas not wall) or just relaxing with a cup of coffee and a good book. Find her blogging over at A Diligent Heart.